(1) In a large mixing bowl or the bowl of your stand mixer fitted with a hook attachment, combine the yeast and warm water. Stir it around and let sit for 5 minutes of until the yeast is foamy and dissolved. Add flour, olive oil, salt, and sugar. Mix by hand or with the dough hook on low speed for 1 minute. (2) Once all of the ingredients are mixed, knead for 7 minutes by hand or with your dough hook on low-medium speed. If your dough is too wet, add up to ¼ cup more flour. After kneading, your dough should be smooth and elastic. Poke it with your finger - if it slowly bounces back, your dough is ready to rise. If not, keep kneading. (3) Shape the dough into a ball and place in a large mixing bowl that has been coated lightly with olive oil. Turn it over to coat all sides. Cover tightly with plastic wrap and allow to rise in a warm environment (about 75-80°F) for about 1 - 1½ hours. (4) For tips on rising, visit our Lessons in Yeast & Baking section. (5) If you substitute regular Red Star Active Dry Yeast, increase rise time to about 2 hours. (6) Punch the dough down to release the air. (7) Divide the dough into two. Roll each half into a ball and let rest in two separate greased bowls, lightly covered for 15 minutes. You may freeze one of the dough balls at this point to use at a later time. Please read Notes section for freezing instructions. (8) Preheat oven to 475°F degrees. Allow to heat for at least 30 full minutes. Every inch of your oven needs to be very, very hot. Grease and dust 2 baking sheets (pizza pans) with nonstick spray or with olive oil. Sprinkle with cornmeal. (9) Prepare your favorite toppings. (10) After 15 minutes, flatten each ball of dough, one at a time on a lightly floured surface or silicone baking mat. You could also do this directly on your cornmeal lined pizza pan. Flatten into a 12-inch round circle, flattening and stretching the dough. If using a pizza stone, place the dough directly on baker's peels dusted with cornmeal. (11) Lift the edge of the dough up to create a lip around the edges. To prevent the filling from making your pizza crust soggy, brush the top lightly with olive oil. Using your fingers, push dents into the surface of the dough to prevent bubbling. Let rest for 15 minutes before topping. (12) Top with your favorite toppings and bake for 12-15 minutes. For the last minute, you can move the pan(s) to the top rack to really brown the edges. That's optional. (13) Slice hot pizza and serve immediately. Store leftover pizza covered tightly in the refrigerator and reheat as you prefer. 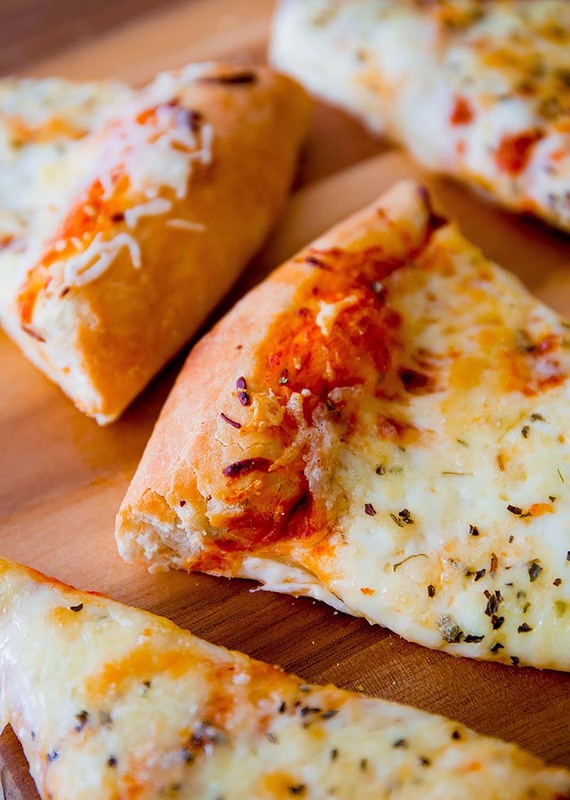 Baked pizza slices may be frozen up to 1 month. After the pizza dough has risen and you divide the dough in half to form into two pizzas (step 7), you may freeze one of the balls of dough to make a pizza at a later time. Or you may simply freeze both balls of dough, separately. Lightly spray all sides of the dough ball(s) with nonstick spray or lightly coat all sides with olive oil. Place the dough ball(s) into individual zipped-top bag(s) and seal tightly, squeezing out all the air. Freeze for up to 3 months. Put your frozen pizza dough ball(s) in the fridge overnight or for about 12 hours to thaw. When ready to make the pizza(s), remove the dough from the refrigerator and set out on the counter to rest for 30 minutes and come to room temperature. Continue with step 8. Just ate the pizza with this dough recipe, and by far the best home dough for pizza I have ever made thanks. Could this be made in a Zojirushi bread machine? Could I get some directions? Yes, as long as your bread machine capacity fits this size dough. Add the ingredients in the order suggested by the manufacturer. Select the dough cycle (this will mix, knead and rise the dough). Once completed, removed dough and continue with step 6. Google gave me 2 very different recipes for pizza dough using Red Star yeast. One says bake at 400 degrees and the other says 475 degrees. Plus the first recipe doesn’t mention kneading by hand and letting it rise. I’m going by the 2nd recipe letting the dough rise. Every time I feel for a pizza, I just go to my web bookmarks and find this dough recipe! I’ve used it more than twice already and it’s never let me down. The crust is nice and crispy, the flavour is perfect and isn’t overbearing, and the dough cooks through every time. Very easy to make. EXCELLENT dough and crust everytime with Platinum Red Star Yeast. This website has become our go-to recipe for homemade pizza nights. I can get two 16″ pizza crusts from one packet of yeast/recipe. I us a little olive oil on the pan before spreading the dough and the pizza peels right off the pan with crispy crust. This recipe is a proven winner! Tried it and it came out pretty good. Used olive oil as the oil. Also, I’ve found that dark baking sheets brown the crust better than a light (aluminum) baking sheet. I also bake my pizzas at 500° for 10 – 12 minutes. Looked up your recipe on line after buying the yeast a week back. Excellent dough and crust! Froze half the dough for another time! Thanks.